Watch as Sergio Garcia bests Justin Rose in the final round at Augusta, winning his first ever green jacket. 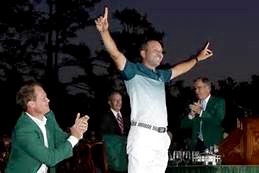 Sergio Garcia’s Masters victory proved popular with his contemporaries on Twitter as they revelled in his long-awaited success. Garcia finally took a major title at the 74th attempt, overcoming Justin Rose in a play-off after the pair finished their final rounds level at nine-under for the tournament. Rose congratulated the Spaniard on the 18th green and then again on social media. “Congrats @TheSergioGarcia Incredible battle out there. Sport in the moment can be tough. But it’s just sport. Hope you guys enjoyed it.” he posted on his account, alongside a picture of the two players after the final hole. Garcia was presented with his green jacket by last year’s winner Danny Willett, who clearly enjoyed watching the final round after missing the cut himself. “Great battle out there between 2 champions @TheSergioGarcia @JustinRose99 Congrats El Nino. Vamos!!!! #themasters” he wrote. There was even a message of congratulations from Tiger Woods, despite his fractious relationship with Garcia in the past. “Congrats TheSergioGarcia. Well earned.” he wrote on his account TigerWoods. The thoughts of 2014 winner Bubba Watson (bubbawatson) turned immediately to the menu for next year’s champions dinner. “Congrats to @TheSergioGarcia! Amazing to watch! What are we eating next year on Tuesday night?? #Champion” he wrote. The plaudits also came from outside the golfing world. “Pretty sweet way to finish TheMasters …. congrats @TheSergioGarcia … well deserved buddy!! !” wrote Olympic champion swimmer Michael Phelps.